A sprocket is a toothed wheel upon which a chain rides. There is a sprocket on a kart's engine shaft or clutch and another one on the drive axle which turns the wheels. The chain between these sprockets transmits the power from the engine to the wheels. Roller chain and sprockets come in a variety of sizes and have to be complementary in size to work correctly. Chain is sized by the pitch (the distance between roller centers). See the chain shown in the picture. Several different standards are used but typically you will see ANSI, ISO, or British Standard. In the ANSI standard, the pitch is given in 1/8" increments as shown in the left digit or digits of the chain size, so a #80 chain would be 8/8 or 1" pitch. A #35 chain has 3/8" pitch. The right-hand digit of the standard denotes 0 = normal chain, 1 = lightweight chain, 5 = rollerless bushing chain. Most 4-cycle carts will use #35 chain. A size that is commonly used on 2-cycle karts is #219 chain. The pitch on #219 chain is .306" while that on the #35 chain is .375". Since the #219 chain is smaller, it has less strength than the #35 chain, but will also give more possible gear ratios for the same space available for your sprocket. 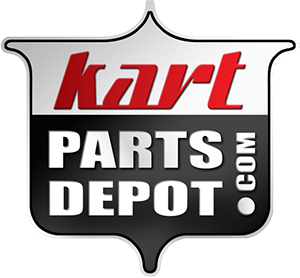 This gives you a better range of gear ratios that can be used to optimize your kart. First, the teeth on the sprockets that you select should be sized to the chain that you are using. If they are incorrect, then the chain will not glide smoothly over the sprocket. After that, the size of each sprocket is determined by the number of teeth that you want, and the number of teeth is determined by how fast you want your kart to go. Sprockets may have no hub or have a hub on one side and they may be split or not. Split sprockets are typically easier to install. Starting out with the RPM of your motor and the circumference of your rear tires, you should be able to calculate your speed given the ratio of the number of teeth on the sprockets on your motor shaft (M motor sprocket teeth) and your wheel axle (W wheel sprocket teeth). That will give your speed in inches per minute. To convert to miles per hour, divide by 1056.